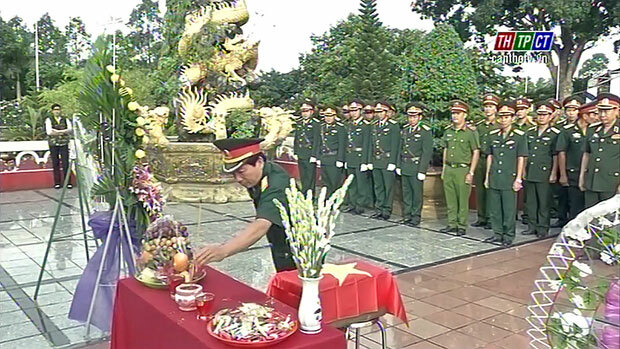 In the morning on July 26th, Cần Thơ city Military Headquarters in coordination with Department of Labor Invalids and Social Affairs opened the ceremony to commemorate remains of martyrs at Cần Thơ Martyrs’ Cemetery. Cần Thơ City Exhumes and Commemorates Martyrs’ Remains. Representative of the steering Committee for Southwester Region, Military Zone 9 and departments, sectors of the city attended. At the ceremony, delegates burn incense to martyrs at the martys cemetery, their remains were collected at Trường Hoà A hamlet, Trường Long commune, Phong Điền district. Last time, the steering committee 1237 of Cần Thơ city collected 15 martyrs’ remains, 5 of which confirmed 5 martyrs./.